By averaging the necessities of blue waters fishing and those posed by comfortable cruising, the Ars Mare yard has recently introduced this boat that rightly mixes the fishing "musts" with the pleasure of cruising. Fishingwise all the requirements have been met: enhanced trim and stability, slow panning speed, quick rolling recovery. On deck fishing activities are also privileged with the low profile bulwarks, easy passages aft and a superstructure of simple and essential lines. 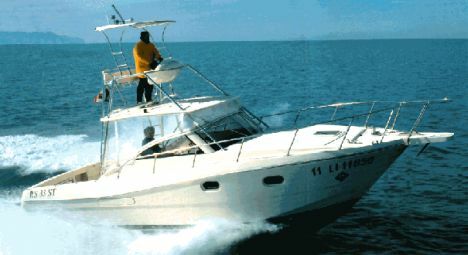 Cruising comfort and sleeping accommodation is surprisingly ample of a fisherman boat of hardly 10 meters LOA. Two elegant and separated cabins and a spacious and luminous bathroom complete the living quarters. This is a well balanced boat displaying an appealing profile line where the tuna tower does not stand out on its own and disturb the pleasing profile. Stainless steel is profusely used on deck and of particular attraction are the tuna tower structure and ladders. A sea trial on the RS 33 ST will clearly display the excellent performance of this boat where the weight/power relationship is undoubtedly low with an equally interesting fuel consumption. The final delivered cost is also interesting considering the quality guarantee given by a boatyard like Ars Mare with its high quality products designed and built by a team of professionals ready to satisfy every owner's request. Average miles range, at a given rpm, is obtained dividing the total fuel capacity (900 liters) for the "liters/mile" corresponding to the entered rpm. Plotted fuel consumption is declared by the engines' manufacturer: tuning of the engines, weight of persons, stores, etc... on board, hull conditions and propeller type can effect the real fuel consumption. Deck and particulars material: stainless steel fairleads, bow roller, chain and anchor, 1000 W electric windlass, sunbathing area, 2 stainless steel cleats, stainless steel handrail. Cockpit particulars: molded side lockers, hydraulic driven engine room hatch, 2 access ladders to the tuna tower, 2 fairleads, 220 V shore line socket, cockpit to swimming platform access door, 2 fully hidden stainless steel cleats, stainless steel grabrails, steps to the side walkways with locker underneath, swimming platform, swimming ladder, 2 convertible dinettes, table, fully hidden galley area with stainless steel sink, two burners stove and 80 liters refrigerator, sliding access door to the cabin, halogen lights, double pilot and co-pilot seats, 2 loudspeakers, transparent cockpit's canvas. Superstructure windows material: stainless steel and toughened glass. Tuna tower particulars: second steering station with engines monitoring instruments and gauges, throttles, steering wheel, compass, fiberglass sole, stainless steel tuna tower. Lay-out and main features: one double cabin and one twin beds cabin both with wardrobe and separated bathroom with shower. Upholstery color and type on request. Steering station: engines monitoring instruments and gauges, log, water and fuel level indicators, horn, windlass remote control( on tuna tower as well), stainless steel steering wheel, throttles. Chart table: to the dashboard's port side. Standard equipment: engine room blower, automatic/manual fire fighting plant. Seakeeping: excellent stability and maneuverability and considering the boat's dimensions displays an excellent trim and a soft wave riding. Rudder and trim tabs response: fast and precise. Visibility: excellent both from the tuna tower and the cockpit. Deck: easy to walk and carefully fitted with excellent stainless steel components. Interiors: well designed giving good living conditions and privacy. Steering comfort: very good and practical. Engine room space: excellent with the hydraulically assisted hatch. Electrical plant: easy to accede with good quality components.